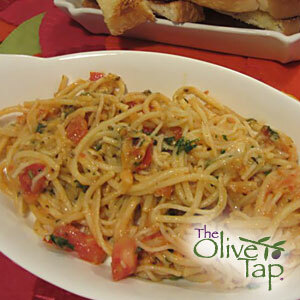 Place tomatoes and garlic in a heavy-bottomed pan. Simmer over low heat for 15 minutes. Meanwhile, cook pasta according to directions for al dente. Add oil, olives, olive tapenade, oregano and chiles to tomatoes. Cook an additional 2 minutes. Season with salt to taste. Drain pasta and toss with tomato mixture.